is the woman going to stay in the wilderness? Is Jerusalem not going to be inhabited again? What did the Babylonian capitivity mean for the new testament times? Q: is the woman going to stay in the wilderness? Rev 12:6 "And the woman fled into the wilderness, where she hath a place prepared of God, that they should feed her there a thousand two hundred and threescore  days." Rev 12:14 "And to the woman were given two wings of a great eagle, that she might fly into the wilderness, into her place, where she is nourished for a time, and times, and half a time [3.5 years], from the face of the serpent. My undertsanding is: At the time of the Abomination of Desolation there starts a 2300 day time where Jerusalem will "be trodden under foot." Dan 8:13 ¶ Then I heard one saint speaking, and another saint said unto that certain [saint] which spake, How long [shall be] the vision [concerning] the daily [sacrifice], and the transgression of desolation, to give both the sanctuary and the host to be trodden under foot? In what context do you ask Christina? What you're suggesting, "there starts a 2300 day time where Jerusalem will 'be trodden under foot'" is way off base. 1) The tribulation is slated for 7 years. What you are therefore suggesting is: the tribulation will last 9 years, 10 months. Also, Luke 21:24 talks of the destruction of Jerusalem in 70 AD, and the intervening 1,897 years she was trodden under foot of the Gentiles until, in 1967, Israel captured east Jerusalem and it became, once more, after some 2500 years, the capital of Israel. During the tribulation itself, Jerusalem will not be "restored" until after the events of Revelation 19. Apologies to you if this sounds or feels like an attack on you; it is not. As none of what you've written here touches on the Gospel itself, I really have no argument with you... just a difference of opinion. Where in the Bible have you seen that the abomination of desolation occurs mid-trib? Do you see that Jesus defines the A of B in Luke 21:20? Daniel 9:27 marks the middle-point of the seven years of tribulation as when the abomination of desolation occurs. And Jesus, in Matthew 24:15 confirms Daniel's prophecy. Therefore, the event occurs mid-trib... 3 and one-half years in, or 1,277.5 days. The events in Luke 21:20, on their own, could very well describe the scene during the tribulation, as many scriptures carry dual applications, but if you read further the time is clearly set (to my mind, at least). Why 70 AD? Look at verse 24 of Luke 21... specifically this portion: "and shall be led away captive into all nations..." This event occurred at 70 AD when, after the destruction of the temple and sacking of Jerusalem, the Jews were scattered across the globe... Jerusalem, then, was trodden down of the Gentiles "until the times of Gentiles be fulfilled" which occurred in 1967. 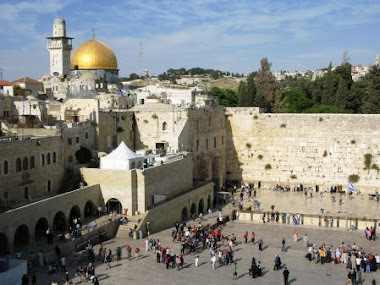 Jerusalem is no longer trodden down by the Gentiles; Israel controls the whole city except the temple mount but that hardly matters since the temple can't be built until after the Antichrist (or Daniel's "Beast") confirms a seven year treaty with Israel. The word 'confirms' is interesting as well in that it implies a treaty already exists... but this is a topic for another discussion. Lastly, this passage of scripture (Luke 21:20-24) doesn't fix the time of the abomination of desolation at all. But Daniel does, and Jesus confirms it in Matthew 24. In verse 6 of Luke, Jesus describes the destruction of Jerusalem and its temple, and it was this event that Jesus is speaking of in verse 20. The temple itself was torn down entirely; not one stone standing upon another (the wailing wall, as it is called, was not part of the temple proper, but rather a retaining wall for the mount itself.) And again, since many prophecies have a dual application (one soon to come [in ancient Israel's time], and one later during the end times) Luke 21:20 likely also describes the event still future when Israelis will need to flee the city and head for the hills (to Petra, as many scholars believe), but the inhabitants of Jerusalem ALSO fled in 70 AD to the mountains (specifically Masada... again, a subject for another discussion). Thanks for caring and sharing your view and concerns. Your beliefs on this are similar to the mainstream evangelical teachings. Dan 9:27 And He [Messiah the Prince] shall confirm the covenant [God's Covenant to His elect] with many for one week [7 years]: and in the midst of the week [3 1/2 years] He [Messiah the Prince] shall cause The Sacrifice and The Oblation to cease, and for the overspreading of abominations He [Messiah the Prince] shall make it [Daniel's city: Jerusalem ("thy Holy city" from verse 24)] desolate, even until the consummation [just like Sodom and Egypt (see Rev 11:8)], and that determined [this prophecy] shall be poured upon the desolate. Three and one-half (3.5) years into this 7 year period the Lord's Blood Sacrifice with His free Gift of Salvation will stop being offered to the Gentiles. This is the fulfillment of "the times of the Gentiles" described in Luke 21:24. Dan 11:21 And in his estate shall stand up a vile person [Antichrist], to whom they shall not give the honour of the kingdom: but he shall come in peaceably, and obtain the kingdom by flatteries. Two-thirds (2/3) of a year (into the final "week" of years) the "peace" will suddenly end with the Abomination of Desolation (spoken of by Jesus and Daniel the prophet). This is the annihilation of Jerusalem by the Gentiles. This will probably be at the hand of radical Islam using nuclear weapons (Luke 21:20)! This is the time when "there shall not be left one stone upon another, that shall not be thrown down (Luke 21:6). Dan 8:13-14: Then I heard one saint speaking, and another saint said unto that certain saint which spake, How long shall be the vision concerning the daily sacrifice, and the transgression of desolation, to give both the sanctuary and the host to be trodden under foot? And he said unto me, Unto two thousand and three hundred days; then shall the sanctuary be cleansed. I believe the antichrist, cooperating with the religious Jews, will take the Muslims out of their way so they can pursue the building of their new temple... of which Messiah the Prince shall annihilate as prophesied in Dan 9:27.